The Los Angeles Raiders had a 9-6 record and needed a win to make the postseason as they hosted the Denver Broncos in the season finale on January 2, 1994. Coached by Art Shell, the Raiders were lightly regarded coming into the season and, indeed, were an inconsistent team, capable of beating strong clubs and falling to far weaker ones. 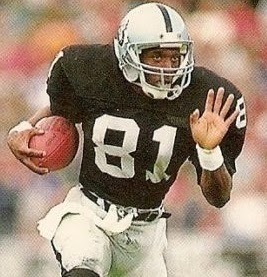 QB Jeff Hostetler, in his first year with the team, was a fine addition to the offense and he had a good receiving corps led by WR Tim Brown (pictured above). However, the running game was mediocre and while the defense had solid performers in DE Anthony Smith, DT Chester McGlockton, and CB Terry McDaniel, the unit was prone to giving up points. Denver, in its first year under Head Coach Wade Phillips, also had trouble running the football but had outstanding 33-year-old QB John Elway and a rising talent in TE Shannon Sharpe. The defense featured a tremendous hybrid pass rushing DE/LB in Simon Fletcher, but was vulnerable against the pass. The Broncos were also 9-6 and had lost to the Raiders in Denver. It was a hazy but sunny day at the LA Memorial Coliseum with 66,904 fans in attendance. Following a three-and-out possession by the Raiders to start the game, Denver drove 55 yards in 12 plays. John Elway threw to WR Arthur Marshall for 23 yards in a third-and-13 situation and Jason Elam put the Broncos on the board with a 52-yard field goal. On the Raiders’ next series, RB Randy Jordan fumbled when hit by LB Mike Croel, who recovered at the LA 31. Three plays later, Elway passed to WR Cedric Tillman for a 27-yard touchdown and, with Elam adding the extra point, a 10-0 Denver lead. Another short Los Angeles possession ended with a punt and the Broncos were driving as the first quarter ended with Elway running for 18 yards on a third-and-10 play. The 11-play series ended with Elam kicking another field goal, this time from 24 yards. The Raiders put together a scoring series of 82 yards in eight plays. 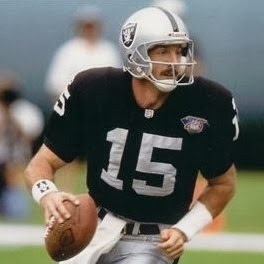 Jeff Hostetler (pictured above) completed four passes, the last to Tim Brown for a four-yard TD. RB Tyrone Montgomery ran the ball three times for 24 yards along the way. Jeff Jaeger added the extra point that cut Denver’s lead to 13-7. However, the Broncos responded by going 83 yards in seven plays to score once again. Elway threw to Shannon Sharpe for a 54-yard touchdown and Elam added the PAT to again put the Raiders behind by 13 points. Hostetler completed back-to-back passes to fleet rookie WR James Jett for 22 yards and to Brown for 24 yards to the Denver 31 as Los Angeles advanced 53 yards in eight plays. The series finally stalled at the 25 and Jaeger kicked a 43-yard field goal. There was a minute remaining in the first half but the back-and-forth nature of the game continued as RB Robert Delpino returned the ensuing kickoff 49 yards to give the Broncos good field position at the LA 43, and they made the most of it. 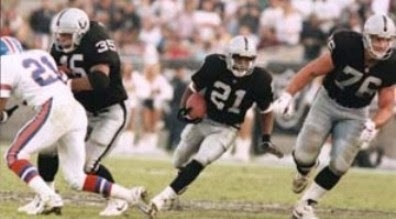 RB Glyn Milburn ran for 13 yards, Elway threw to Sharpe for another 28 yards, and three plays later he connected with Sharpe again from a yard out for a touchdown. Elam added the extra point. The Raiders, in the last 24 seconds, benefited from three Hostetler pass completions that set up a 50-yard Jaeger field goal. Denver led by 27-13 at halftime. The Broncos took the second half kickoff and put together a nine-play, 71-yard drive to put more points on the board. Elway threw to Sharpe for 21 yards and to WR Kitrick Taylor for another 28. The series stalled at the LA 17 and Elam booted a 27-yard field goal to give the visitors an imposing 17-point lead. The Raiders fought back as Hostetler completed three passes to Brown that highlighted an 82-yard drive. The first was good for 26 yards to the Denver 45, the second gained 15 yards on a second-and-11 play, and the third covered 24 yards and scored a touchdown. Jaeger’s extra point made it a ten-point game at 30-20. The Broncos reached the LA 44 before having to punt on their next series. The Raiders opened the fourth quarter with a 52-yard Jeff Gossett punt that pinned the Broncos back at their 15. Denver punted in turn and, with LA getting the better of the field position battle, the Raiders started off at their 49 and advanced 31 yards in seven plays, the biggest of which was a Hostetler to Brown completion that picked up 25 yards. Jaeger kicked a 39-yard field goal and Denver’s lead was down to seven points. The Broncos had to punt following their next possession and Tom Rouen’s kick was blocked, but the Raiders were unable to move the ball on offense and had to punt it back. Another short series ending with a punt gave the ball to the Raiders at their 30 with just under three minutes left in regulation. With Montgomery both running and catching the ball, the Raiders reached the Denver 40. Hostetler completed two passes of 13 yards apiece to Brown to reach the 14, and two more short throws picked up another 10 yards. Two more passes fell incomplete, but with eight seconds left Hostetler connected with WR Alexander Wright, who had gotten open when defending CB Charles Dimry fell, for a four-yard touchdown on the 13th play of the series. Jaeger successfully added the all-important extra point, and the fourth quarter ended with the teams tied at 30-30. The Broncos had the first possession in overtime, and it appeared that they would prevail. Elway threw to Tillman twice, for 20 and 30 yards, and having reached the LA 22, Elam came in to attempt a 40-yard field goal. However, the rookie’s kick sailed wide to the left to give the Raiders a reprieve. A short carry by Montgomery was followed by Hostetler taking off for a 19-yard gain and, after RB Napoleon McCallum ran for four yards, Hostetler completed a pass to TE Ethan Horton for 20 yards to the Denver 32. Two more runs netted three yards and, after a Hostetler pass was incomplete, Jaeger came in and kicked a 47-yard field goal to give the Raiders a 33-30 win at 7:10 into the extra period. Denver had more total yards (471 to 398) while Los Angeles had the edge in first downs (24 to 22). The Raiders gave up the only turnover of the contest and the Broncos recorded three sacks, to none by LA. Jeff Hostetler completed 25 of 41 passes for 310 yards and three touchdowns with none intercepted, and he also ran for 26 yards on two carries. Tim Brown had a big day with 11 catches for 173 yards and two TDs. Tyrone Montgomery (pictured below) paced the ground game with 44 yards on 13 attempts. For the Broncos, John Elway was successful on 25 of 36 throws for 361 yards, also with three TDs and no interceptions. Shannon Sharpe caught 6 passes for 115 yards and two touchdowns and Cedric Tillman contributed 5 receptions for 91 yards and a score. Robert Delpino ran for 66 yards on 20 carries. With the win, the Raiders finished second in the AFC West with a 10-6 record, grabbing the first Wild Card spot in the postseason. Denver, at 9-7, ended up third in the division and, thanks to advantageous tiebreakers, also qualified as a Wild Card team. Thus, the two teams met again at the same venue the following week in the Wild Card playoff round and the Raiders again won, this time by a more convincing tally of 42-24. LA lost to Buffalo at the Divisional level. Tim Brown caught 80 passes for 1180 yards (his first of nine straight thousand-yard receiving seasons) and seven touchdowns. He was selected to the Pro Bowl. John Elway led the NFL in pass attempts (551), completions (348), and yards (4030) and he topped the AFC in passing (92.8 rating), TD passes (25), and completion percentage (63.2). He also received Pro Bowl recognition. 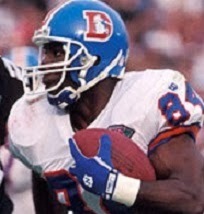 Shannon Sharpe (pictured at right) caught 81 passes for 995 yards and nine touchdowns, not only gaining selection to the Pro Bowl but receiving consensus first-team All-NFL honors for the first time as well.